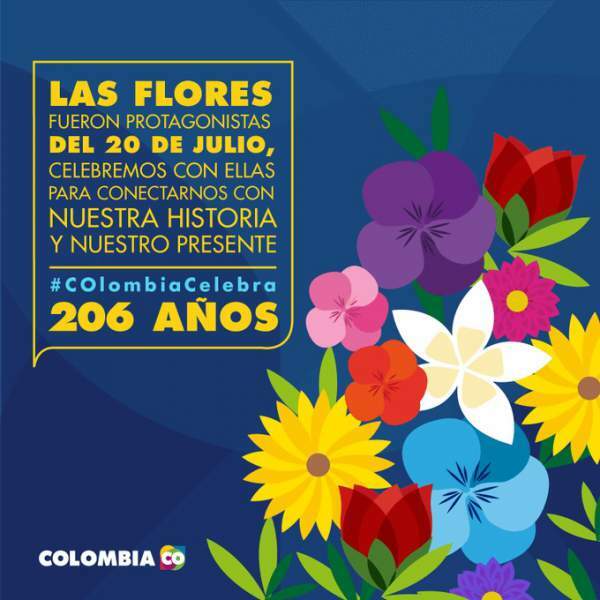 Independence Day of Colombia (Independencia De Colombia) July 20 (20 de Julio): This July 20 is celebrated the Colombian Independence Day. Today marks 206 years of the signing of the Act of the Revolution in 1810, the Congress of Colombia officially declared as the anniversary of the proclamation of national independence in 1873. That is 63 years after the signing. The truth is that Colombia lived several declarations of independence over a decade, but it was 1810 which remained in the collective memory. However, other Colombian symbols were not made official until many years later. For example, the tricolor flag was regulated on 26 November 1861; the anthem became official in 1920 and the shield would not until August 6, 1955. And why it is celebrated the Colombian IndependenceDay on July20? After the invasion by Napoleon in 1808, in Spain, they organized meetings of government at the local level had to resist the invader and, simultaneously, to govern in the absence of King Ferdinand VII. However, although these governing boards were also present in the colonies, they were much lower than on the mainland. Also, keep in mind that there had already been some voices who in 1809 wanted independence from Spain in other colonies, such as Ecuador and Bolivia. This breeding ground prompted the July 20, 1810, a meeting of notables of Santa Fe (composed of civil authorities and Creole intellectuals) provoke an altercation at the home of Spanish José González Llorente, which ended up resulting in the signing of the Declaration of Independence Santa Fe, 1810. The IndependenceDay also coincides with the opening of the new legislature in the Colombian Congress. This year will have a particularity, and that will be the last national holiday before the peace agreement with the FARC after nearly four years of negotiations in Havana is signed. The day in which the president, Juan Manuel Santos, will give a speech to all the deputies, will be marked by protests fueled by his predecessor, now a senator Alvaro Uribe, who has called to reject the agreements with the FARC and for that he has called for a black tie is placed next to the flags of Colombia.